With 45 years in the industry, the SEA CON Group are leaders in underwater connection system solutions and connector technology and provide an extensive, diverse range of electrical, optical and hybrid system solutions that include connector assemblies, submersible switches and cable termination solutions for many applications within the oceanographic, defense, oil and gas, undersea vehicle operations, and environmental markets. The company has evolved from a small California electrical connector manufacturer in 1968 to a global system supplier with 800 employees in five countries today. SEA CON has historically provided solutions to both current and future industry needs. It achieves this by identifying technology gaps within a market and then solving those problems. 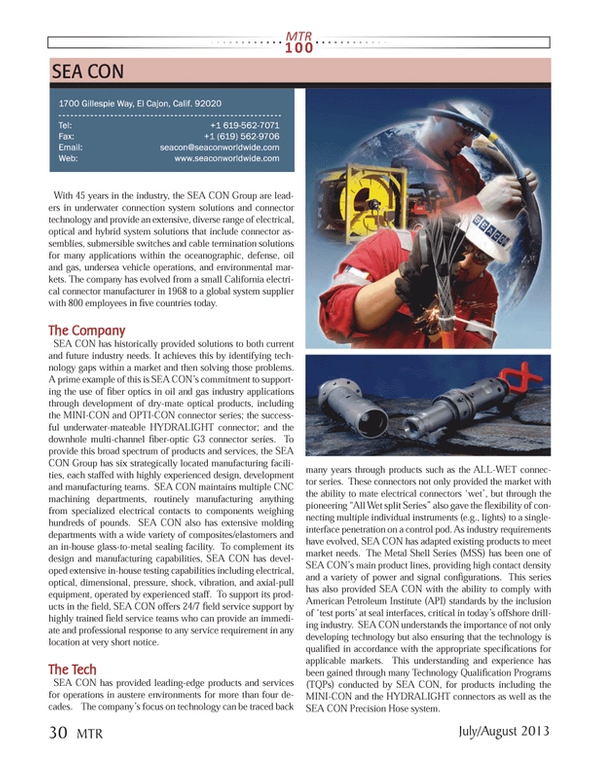 A prime example of this is SEA CON’s commitment to supporting the use of fiber optics in oil and gas industry applications through development of dry-mate optical products, including the MINI-CON and OPTI-CON connector series; the successful underwater-mateable HYDRALIGHT connector; and the downhole multi-channel fiber-optic G3 connector series. To provide this broad spectrum of products and services, the SEA CON Group has six strategically located manufacturing facilities, each staffed with highly experienced design, development and manufacturing teams. SEA CON maintains multiple CNC machining departments, routinely manufacturing anything from specialized electrical contacts to components weighing hundreds of pounds. SEA CON also has extensive molding departments with a wide variety of composites/elastomers and an in-house glass-to-metal sealing facility. To complement its design and manufacturing capabilities, SEA CON has developed extensive in-house testing capabilities including electrical, optical, dimensional, pressure, shock, vibration, and axial-pull equipment, operated by experienced staff. To support its products in the field, SEA CON offers 24/7 field service support by highly trained field service teams who can provide an immediate and professional response to any service requirement in any location at very short notice. SEA CON has provided leading-edge products and services for operations in austere environments for more than four decades. The company’s focus on technology can be traced back many years through products such as the ALL-WET connector series. These connectors not only provided the market with the ability to mate electrical connectors ‘wet’, but through the pioneering “All Wet split Series” also gave the flexibility of connecting multiple individual instruments (e.g., lights) to a single-interface penetration on a control pod. As industry requirements have evolved, SEA CON has adapted existing products to meet market needs. The Metal Shell Series (MSS) has been one of SEA CON’s main product lines, providing high contact density and a variety of power and signal configurations. This series has also provided SEA CON with the ability to comply with American Petroleum Institute (API) standards by the inclusion of ‘test ports’ at seal interfaces, critical in today’s offshore drilling industry. SEA CON understands the importance of not only developing technology but also ensuring that the technology is qualified in accordance with the appropriate specifications for applicable markets. This understanding and experience has been gained through many Technology Qualification Programs (TQPs) conducted by SEA CON, for products including the MINI-CON and the HYDRALIGHT connectors as well as the SEA CON Precision Hose system.